A Susie Middleton cookbook is always an occasion for celebration. 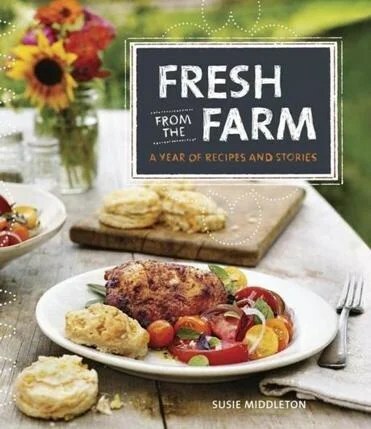 As she demonstrated in Fast, Fresh & Green and The Fresh & Green Table, the former cooking magazine editor turned small farm owner has a feel for finely tuned, robustly flavored food using the freshest ingredients. I tested this book at the beginning of the growing season, when few crops besides arugula and radishes were ready. Now, at the end of the season, there have been the usual garden heartaches (fingerlings and tomatoes lost to blight, poor output from the new strawberries) but a few proud stands of greens and beans remain. No matter how hard-won and scant your own end-of summer kitchen garden may look, you’ll find a fitting way to enjoy the last of it in these pages. Click here to read today’s review of ‘Fresh from the Farm’ in the Boston Globe. Hit the paywall? Click here for the PDF version of this week’s ‘Fresh from the Farm’ review.